Ph.D. ? President, Rensselaer Polytechnic Institute, Troy, N.Y.
With a string of firsts to her name, Shirley Ann Jackson, Ph.D., likely is used to attention. Cur-rently the 18th president of Rensselaer Polytechnic In-stitute, the oldest private U.S. technological research university, she is the first African-American woman to head a national research university. As president, she led the development of The Rensselaer Plan (the Institute?s strategic blueprint) and is leading the fulfillment of its provisions. She also secured a $360 million unrestricted gift commitment to the university. 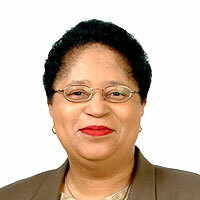 In 1995 Jackson was named chairman of the U.S. Nuclear Regulatory Commission by then President Clinton, becoming the first woman and the first African-American in that role. She reorganized the agency and revamped its regulatory approach by introducing risk-informed, performance-based regulation. Jackson formerly was president of the American Association for the Advancement of Science and is the current chair of its board of directors. She is a member of the National Academy of Engineering?the first African-American woman to be elected to the group?and is a fellow of the American Academy of Arts and Sciences and of the American Physical Society. She also has membership and advisory roles in other prestigious national organizations. Jackson holds a doctorate in theoretical elementary particle physics and an S.B. in physics from the Massachusetts Institute of Technology, as well as 34 honorary doctoral degrees from other institutions. She is the first African-American woman to receive a doctorate from MIT in any subject, and is one of the first two African-American women to receive doctorates in physics in the United States. Her parents were ?caring and supportive role models? during her climb to success, she says, while Marie Smith, ?an inspirational math teacher,? and Paul E. Gray, former MIT president and an early mentor and supporter, were important influences in her life. Perhaps it is in recognition of the importance of early influences that Jackson desires to ?elevate the aspirations of all young African-American children and to help place more of them on the track to move into careers in science and engineering. ?